One would be hard-pressed to flip through a magazine, open a newspaper or turn on a television without seeing director Quentin Tarantino's mug, typically accompanied these days by talk of the just-released Grindhouse, his collaboration with Robert Rodriguez (Sin City). A schlocky tribute to the exploitation flicks of the 60s and 70s, Grindhouse may have started a trend: cinematic throwbacks to a lesser-yet-greater time in film history. When guns were louder, breasts were larger and plot was nonexistent. This time, however, what was once considered trash will be held up, for better or worse, as high art. All it takes is a knowing wink of self-conscious tone. Soon-to-be-nauseating fads aside, Grindhouse has opened up a lot of talk about Tarantino, a director that has been largely under the radar since his two-part samurai homage Kill Bill left theaters in 2004. Wait a minute. He's been doing homages all this time? As Jules might say, "Correctamundo." Tarantino burst onto the scene as a brash young up-start with Reservoir Dogs in 1992. It had a simple plot involving a heist and a color-coded team of robbers. The heist goes wrong, they fall back to an old warehouse and we take it from there. As far as a narrative, that's pretty much it. What got people talking was, well, the talking. The movie, told out of sequence, is dialogue-heavy, but it succeeds in making you want to hear everything these characters have to say. It even opens with all of the main characters discussing "Like a Virgin" by Madonna before debating as to whether tipping waitstaff makes any sense at all. It should be boring, but Tarantino makes it work. As a film, it's the one that's most evocative of Tarantino's style. Why you might ask? Because every one of his later projects is an homage. Adapting the filmmaking style he established in Dogs to familiar genres, Tarantino has become the most original unoriginal guy in Hollywood, if that makes any sense. And no, that's not an insult. Pulp Fiction hit two years later, earning a well-deserved Oscar nod and a considerable fanbase. Everything about it was a throwback to, well, pulp fiction. In other words, the film was a reference to inexpensive magazines published from the 20s to about the 50s. They typically contained lurid subject matter, making it the ideal stomping ground for Tarantino. An all-star cast, great dialogue and interweaving story segments make the film a modern classic and Tarantino's best work to date. Then came Jackie Brown in 1997, Tarantino's first homage to a specific film genre. This time, he chose the blacksploitation films of the 70s, choosing, appropriately enough, genre star Pam Grier. An all-star cast, including Robert DeNiro, Samuel L. Jackson and the aformentioned Grier make the film watchable, but it just doesn't have the same bite as Dogs or Fiction. Tarantino then took a long break to perfect his martial arts epic Kill Bill starring Uma Thurman as The Bride, a character Tarantino and Thurman had concocted during the filming of Fiction years earlier. It was split into two parts, with Part 1 opening in 2003 and Part 2 opening the following Spring. The film is clearly paying reference to the samurai films of the 70s, starring martial artists such as Sonny Chiba and Bruce Lee. Yet, this prototypical samurai revenge film is given a post-modern twist, particularly in the second half. 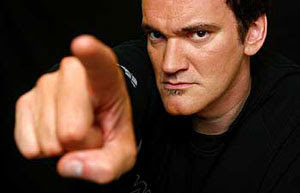 It could use some editing, as some of the dialogue tends to drag, but the film(s) turned out to be a return to form for Tarantino and had everyone frothing at the mouth for his next feature: a World War II film entitled Inglorious Bastards. We're still waiting for that film, unfortunately, as Grindhouse has been occupying a great deal of Tarantino's time. Looking back at his body of work and finding mostly films referencing earlier genres has many thinking: what would a modern Tarantino come up with? He's a great director, and he seems to enjoy turning genres he fell in love with on their heads and injecting them with a pop culture sensibility, but isn't Tarantino the type of director who could easily forge ahead and come up with something truly original in idea-starved Hollywood? You could consider the two films he's written but didn't direct as more of an original story... "True Romance" and "Natural Born Killers." Yet, both films has spawn many elements from the film "Badlands." Ah, too true. I think I need to check out both of those again. Netflix it is. I have(and love) true romance, if you ant to borrow it. Also there were very well be a reason that he never made those movies. Too Modern?